The 336 grt fishing vessel Rey De Olaya caught fire in it’s accommodation section off the Scilly Isles, United Kingdom. The vessel sent out a distress call requesting assistance to the Falmouth Coast Guard. Several cargo vessels were alerted and proceeded to the Rey De Olaya location. When help arrived on scene, the Rey De Olaya’s crew was able to extinguish the fire and restore power. Reports state 1 crewman perished with 15 crewmen uninjured. Vessel to be towed to Burela, Spain. 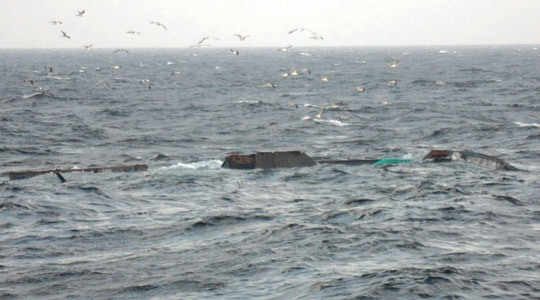 A fishing boat capsized in the Yellow Sea off the coast of Gunsan, South Korea. The vessel was illegally fishing when approached by the South Korean Coast Guard. The fishing vessel had rammed the larger Coast Guard vessel allowing other fishing boats to escape. Reports stated 7 crew were rescued with 3 lost. The 1810 dwt freighter Sunrise collided with a fishing trawler in the Sea of Japan near the South and North Korea border. The vessel sustained damage and the hull was holed. Reports of water ingress with a resulting list to starboard. The Sunrise was able to reach the port of Sokcho, South Korea. No reports of injury of the 17 crewmen onboard.